If you’re selling your home, you know how important it is to have it looking its absolute best. First impressions are key, as potential buyers will form opinions about your home before they even step through the front door. While hiring a professional staging company can make your home look amazing, not everyone is ready or able to shell out the big bucks. Fortunately, there are things you can do yourself to make your home stand out. Here are some of the best ideas we’ve found that will maximize your home’s assets. Any potential buyers looking at your home are trying to visualize themselves in the space. By removing personal belongings, you make it that much easier for them. Pack up family photos, knickknacks, books and anything else that is personal to you. While there is no one-size-fits-all color for every home, there are certain neutral colors that work best for home staging, according to experts. White, off-white, beige, gray and even soft yellow work the best in most situations and should be chosen based on the style of your home and how much light the room receives during the day. Even if your home already has neutral-colored walls, it’s a good idea to repaint if you haven’t already done so within the last year. Nothing makes a home feel fresh like a new coat of paint. It should go without saying, but a clean home is an absolute necessity when selling. If you can, hire a professional cleaning company to come in before you show your house, and be sure they get into all the nooks and crannies. In addition, make any needed repairs, such as loose doorknobs, scratched floors or cracked lighting fixtures. Also make sure to address any lingering odors such as cooking and pet smells. You want to give the appearance of your home being spacious and airy — so turn on all the lights. If your lighting fixtures have low-wattage bulbs, replace them while your home is on the market. Add floor or table lamps to rooms that seem dark, and keep shades and curtains open on all the windows. Your home will look more spacious if you clean out closets and remove any furniture that makes a room feel cramped. Rearrange remaining furniture to create an easy flow through the house. Remember — all closets and cabinets will be opened, so declutter and organize what remains inside them. This includes clothes in bedroom closets, linen closets and kitchen cabinets. Clean off kitchen countertops, removing small appliances like toasters, coffee pots and microwave ovens. The first thing buyers will see is the front of your home, so clean up any debris in your yard, mow the lawn, add annual flowers for an instant pop of color and tidy the entryway. In some cases, pressure-washing the outside of your home can also leave it looking fresh and inviting. 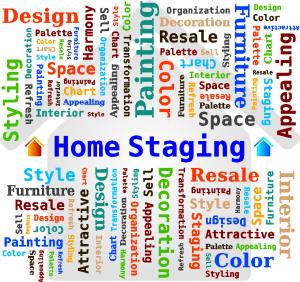 Even if you’re on a budget, home staging is an important part of the selling process. Follow the tips above to create a home environment that is enticing to potential buyers, and you’ll be well on your way to an offer!